Wow, great job all around man. The windshield looks sharp and functional. The bed adds to the look and will definitely come in handy, is it a dump bed? Great idea on the hitch receiver and nice fab skills. Thanks Joe! No, for now the bed is fixed. I might make it a dump in the future though, wouldn't be that hard. Mainly I kept alot of things fixed to minimize rattles and noise. TxAg, love the attention to detail on your build. How bright are your led headlights & are you satisfied with them? Also when I lifted my rear I flipped the u bolts so they were not an obstruction. Wish I would have thought of that before I put them on the first time! You know, the headlights are one place that I'm really happy I spent a little extra. The LED's are very bright, light up the night. Very satisfied with them. And it's great to have peace of mind that I'm buring about 1/3 the power of noromal lights. Good tip on the U-bolts, and thanks! Just wanted to say ... Welcome to BGW and Nice Build. Impressed at the detail you put into this. It even gave me a few ideas for the project me and my boys are working on. I really like the cleaning of the frame. I did do a battery tray cleaning and I painted it with spray can bed liner to help protect it in the future. I dig the brush guard with the receiver built in. Are you going to put a removable winch in there when out hunting? Over all what a great job and thanks for the detailed posts and pics. I've got a winch for it now, and had originally planned to mount it permanently. But then I got to thinking about how that extra weight, extra power draw, etc and I don't really need to for the ranch. So, that particular project is in the "maybe" column for the future. I do have a little road feeder that mounts to the front reciever hitch. The controller is wired in already, which makes it very convenient to pull on and off. Alright, enough of all the build pics. How about some fun time pics? 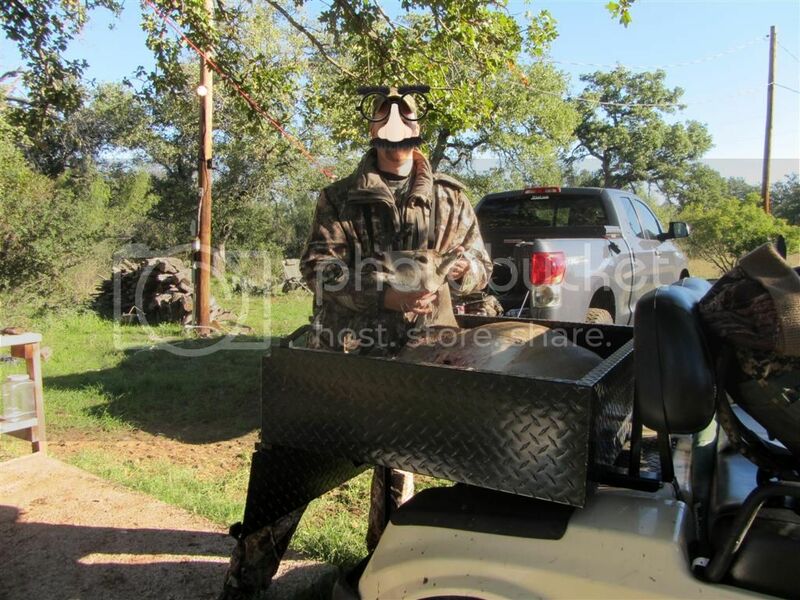 By now the cart has been out to the ranch several times hunting and working, and I’m really happy with it. 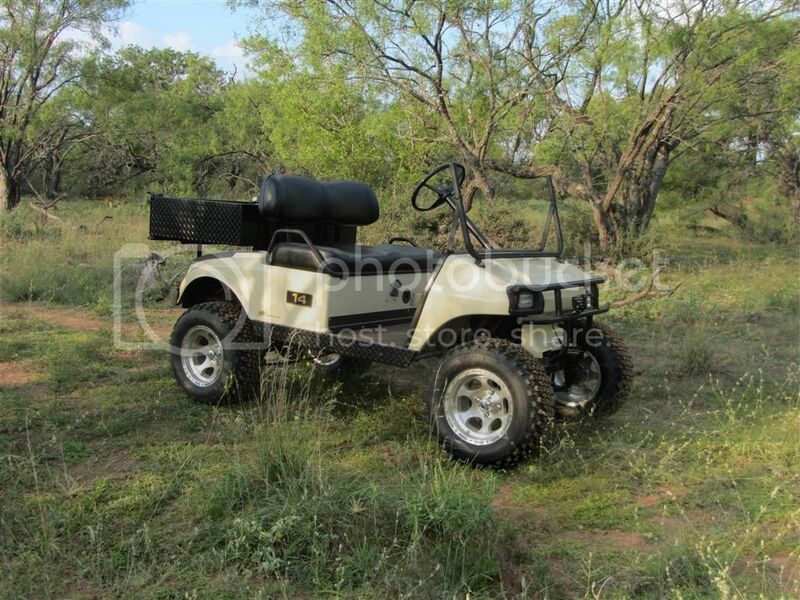 It allows me to creep around very quietly, and it works great for hauling deer and feed. I've had 400lbs of feed in the bed, and it moves it no big deal. It goes pretty much anywhere, and has lots of low-end torque on the hills. I have taken it some places I probably shouldn't have, but the combination of good ground clearance, tihgt turning radius, and lots of torque makes it a good little off-roader. It's also working out great for hunting. 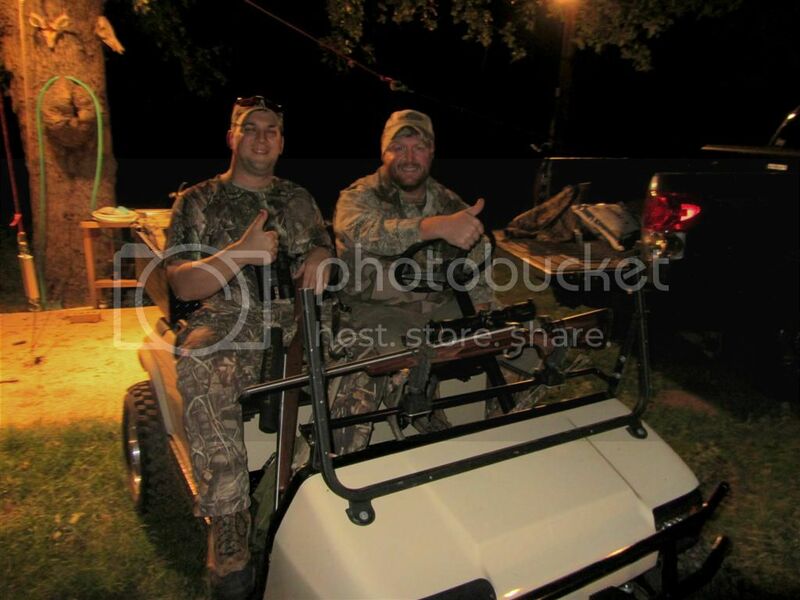 It is quickly earning a reputation as a meat wagon as it allows us to go retrieve deer without having to drive a truck in and ruin the spot. I have driven right up to a few deer at night with the red LED and they just stand there and look at me. If there is anything I regret it's that I wish I would have ponied up for the Long Travel lift kit. The kit I have now is quality, and holding up just fine, but the ride is pretty rough. I also had to get creative to solve some squeeking and creeking. I took a plastic bicylce tube, cut it flat, and sandwhiched it between the cart frame and the front suspension carrier. That greatly improved things. nice harvest makes for happy fellas. Nice action pics, good to see you're enjoying all the hard work you put into it. As for the stiff ride, check out Streetbu's thread. He has the 8" version of the same kit and modified the springs on the front to give it a softer ride for pretty cheap. I'll be doing the same modification once I get my project up and running. Wow, what a cool build. You've given me a lot of good ideas for my next build. I really appreciate all of the detail and pictures. I am doing a top to bottom rebuild on a 2003 club car DS. How did you get the accelerator off?